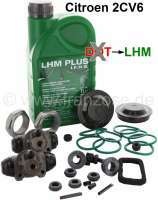 sample image Label "LHM" for the brake fluid reservoir. Suitable for Citroen 2CV, Dyane etc. 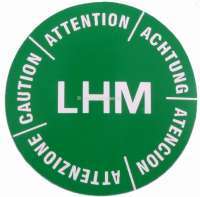 sample image Label "LHM" for the brake assembly, Citroen AMI8. sample image Brake repair set small, if inadvertently DOT (incorrect) brake fluid used, instead of LHM (correct). This set consists of all necessary rubbers + new brake calipers, master brake cylinder (Proprietary brand) + 2x wheel brake cylinders (ATE . 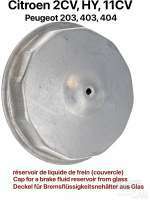 For Citroen 2CV6 (with disc brake), if inadvertently normal brake fluid DOT were filled in. Note: Still much work, but the brake calipers, master brake cylinder and wheel brake cylinder are new parts! sample image Brake repair set small, if inadvertently DOT (incorrect) brake fluid used, instead of LHM (correct). This set consists of all necessary rubbers + new wheel brake cylinders. 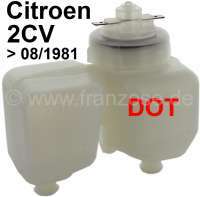 For Citroen 2CV6 (with disc brake), if inadvertently normal brake fluid DOT were filled in. Note: Much work. The master brake cylinder + the brake calipers must be dismantled! sample image Brake fluid reservoir seal for the locking cap (2 circle). Suitable for Citroen 2CV, with LHM double circle brake system. sample image Brake fluid reservoir with locking cap, for the brake system DOT. Suitable for Citroen 2CV to year of construction 1963. Peugeot 202, 203, 403, 404. Renault rear engine, R4. Diameter: 57mm. Reservoir height with locking cap: 97mm. Threaded connection on the master brake cylinder: 3/4 16h. Made in Spain. 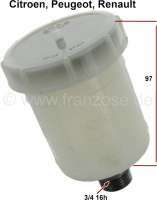 sample image Brake fluid reservoir with locking cap, for the brake system DOT. Suitable for Citroen 2CV with front drum brake. Diameter: 57mm. Reservoir height with locking cap: 97mm. Threaded connection on the master brake cylinder: M16 x 1,5. Made in Spain. sample image Brake fluid reservoir with locking cap, for the brake system DOT. Suitable for Citroen 2CV6 with front drum brakes. The reservoir is white dyed and has a white lid. The connection on the master brake cylinder is from center to center: 70mm. 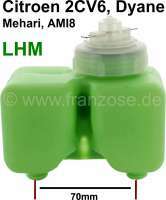 sample image Brake fluid reservoir with locking cap, for the brake system LHM. Suitable for Citroen 2CV, Dyane, AMI8 with front disk brake system and single circuit brake system. Diameter: 56mm. 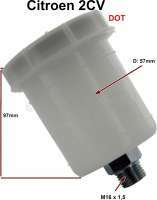 Reservoir height with locking cap: 100mm. Threaded connection on the master brake cylinder: M16 x 1,5. Made in Spain. sample image Brake fluid reservoir connection rubber. For the connection from the glass container to the master brake cylinder. Dimension: Diameter above: about 20-21mm. Diameter down: about 12mm. Inside diameter down: 6.0mm. This system of the securement was used by many france classic car`s. E.G. Citroen 11CV + 15CV, Citroen HY, Citroen Ami. Peugeot + Renault. sample image Brake fluid reservoir connection rubber. For the connection from the glass container to the master brake cylinder. Dimension: Diameter above: about 20-21mm. Diameter down: about 12mm. Inside diameter down: 8.0mm. This system of the securement was used with many französichen car. E.G. Citroen 11CV + 15CV, Citroen HY, Citroen Ami. Peugeot + Renault. sample image Brake cylinder paste of FÖRCH, 5g. Full-synthetic brake cylinder paste for hydraulic brake systems. Durability of brake cylinders is extended. Protects against corrosion. Compatibly with the brake fluids DOT 3, DOT 4 and DOT 5.1. Keeps lubricated collars. Assembly aids for O-rings, lip seals, collars and others. Sealing components from elastic materials. sample image Cap for a brake fluid reservoir from glass. Thread about 44mm. 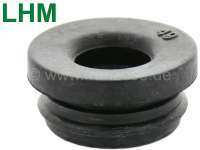 Suitable for Citroen 11CV, 2CV, HY, Panhard, Peugeot 203, 403, 404.
sample image Master brake cylinder fixing bolt (in the front wall). Suitable for Citroen 2CV with hanging brake pedal. The screw are the same, if you have a single circuit brake system or dual circuit. Also for LHM and DOT brake system. sample image Master brake cylinder seal in the engine front wall. Suitable for Citroen 2CV with a dual circuit brake system (DOT + LHM). Very good reproduction, from foam rubber. Or. No. AM453-211. Made in Germany. sample image Master brake cylinder seal in the engine front wall. Suitable for Citroen 2CV with single circuit brake system and hanging brake pedal. Or.Nr. : A453-211. Made in Germany. sample image Master brake cylinder rubber seal (1 pair, green dyed)) for the brake fluid reservoir. Brake system LHM. Dual circuit brake system. Suitable for Citroen 2CV6 starting from year of construction 9/1981. Reproduction! sample image Master brake cylinder rubber seal (per piece) for the brake fluid reservoir. Brake system LHM. Dual circuit brake system. Suitable for Citroen 2CV6 starting from year of construction 9/1981. Reproduction!